Max&rsquo;s is a veteran in the Australian supplements industry and for good reason. They’ve consistently produced some of the best supplements on the market and run one of the most successful body transformation challenges in the country. Having been awhile since they’ve overhauled their protein range, Max’s have come out with a bevy of updated products including the Max&rsquo;s Clean Mass Lean Gainer. Each 120g serve of Clean Mass provides 460 calories, 36.2g of protein, 73.4g of carbs and 2.5g of fat. Clean Mass is an upgrade from Max’s Supersize and utilises a blend of higher quality and different ingredients. Having done their research, Max’s have incorporated a sustained blend of protein sources as well as carb sources. The five different proteins will help to supply the muscles with amino acids over a longer period of time, which has been shown to support improved muscle building1. By including a carb complex rather than the use of a single carb, Clean Mass can help sustain energy and insulin levels over a longer period of time to further support a more anabolic, muscle building environment. Finally, the Clean Mass Support Matrix contains all the right ingredients to boost the speed of recovery. This has the benefit of allowing you to work out more frequently and put your body through the stimulus to build more lean muscle. While Max’s Clean Mass is an excellent gainer for those after lean gains, if you’re a trainer who finds it extremely difficult to gain weight, it might not be the most ideal product. In terms of mass gainer proteins, Clean Mass belongs to the moderate range when it comes to calorie density. As such, it’s ideal for those who want to gain weight at a more moderate pace or who want to minimise fat gain during their bulking process. Overall though, there aren’t too many issues we can pick with the new Clean Mass formula. If we were to be nitpicky, it would be that the inclusion of glutamine and BCAAs isn’t an absolute necessity. After all, you should be getting plenty from the actual protein blend itself. 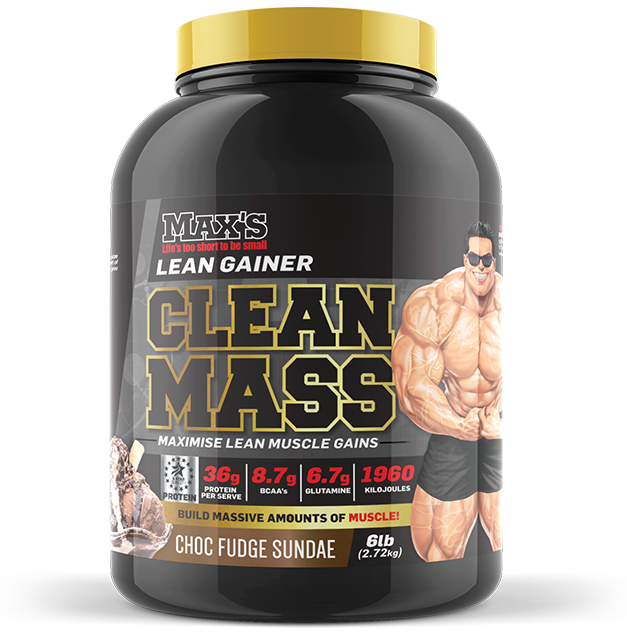 The new Clean Mass will be available in two flavours including: Vanilla Cream Cake and Choc Fudge Sundae. If you were used to the delicious taste of Super Size, then Clean Mass shouldn’t prove too much of a difference. Both flavours are easy to mix without any significant clumping or residue. Unlike many other mass gainers, the formula isn’t super thick or overly sweet, so you can easily have 2-3 serves throughout the day. Want to gain quality lean muscle mass? How about reducing fat gain during a bulking phase? If you answered yes to either of these questions, you’re going to want to get your hands on the Max’s Clean Mass. The formula is a step up from the Max’s Super Size mass gainer and utilises an improved blend of sustain release proteins and carbs. So if you want a tasty product that helps to maximise your anabolic potential, then you really can’t go wrong with the Clean Mass lean gainer from Max’s.